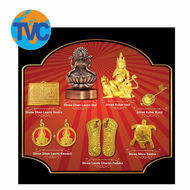 Buy Adbhut Shri Hanuman Chalisa Yantra (FREE- Fix Scratch PRO) online - TVC Skyshop - Buy world-class innovative products at affordable prices offering full value for money. Shri Hanuman ended Lord Ram’s troubles and destroyed The Lanka and was named “Sarva Sankat Mochan”. According to the Great Puranas reciting the Hanuman Chalisa ends all difficulties, saves from the evil eye and grants victory over enemies. This amazing 24 carat gold plated yantra has the full text of Hanuman Chalisa printed in it. Wearing this locket removes all barriers in jobs and businesses, protects from disease and makes you brave and strong. It is also very effective in resolving vastu defects also. Beautiful as a jewel and extremely effective the “Adbhut Shri Hanuman Chalisa Yantra” is now available with a special offer rate, only at Rs. 2890. This is a limited period offer so order your “Adbhut Shri Hanuman Chalisa Yantra”. The full text of the Hanuman Chalisa in this amazing yantra. Special Offer: The first 1000 callers will get a free 24 carat gold plated chain free!